Didima camp boasts their recently opened San Rock Art Interpretive Centre providing fascinating insights into the art and culture of the San, and includes static displays and audio-visual presentations within a reconstructed rock shelter. A truly mesmerizing experience -not to be missed at any cost. The Ukhahlamba Drakensberg Park is renowned for the exceptional beauty of its mountainous landscapes, filled with hidden natural and cultural treasures, and is listed as South Africa's first cultural and environmental World Heritage Site, meaning that it has both natural and cultural values of outstanding universal importance. Beyond its natural beauty and diversity of animal and plant species, as well as the variety of its habitats, the power of its cultural values lies in the San hunter-gatherers and their pre-eminent rock art, the quality, multiplicity and religious nature of which contributed greatly to the UDP's World Heritage status. 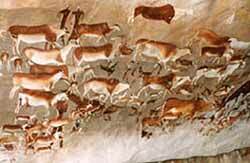 The Park is one of the most densely painted regions in Africa, if not the entire world, containing some 550 known San rock painting sites, amounting to over 40 000 recorded individual images. Archaeological evidence has shown the San lived in this area from approximately 8 000 years ago and revered the eland as an important symbol of power and supernatural potency with great religious significance. "!gi", a supernatural power, much sought after by San healers. Ezemvelo KZN Wildlife has developed a camp which pays special tribute to this historic area - Didima camp - which has been themed around the art of the San people. 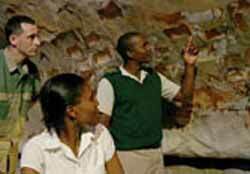 The camp boasts their recently opened San Rock Art Interpretive Centre providing fascinating insights into the art and culture of the San, and includes static displays and audio-visual presentations within a reconstructed rock shelter. A truly mesmerizing experience -not to be missed at any cost. On exiting the auditoium, visitors are introduced to the Ndumeni Craft Centre where they have an opportunity to purchase hand-made crafts made by local people. The centre does not profit from the sales as the intention is to help the local community make a living from their skills and talents. After a great experience at the centre, take the opportunity to visit the Ndumeni Centre where you will be able to buy a variety of interesting articles that will always bring back great memories of your visit to Didima Camp. Overlooking a clear mountain stream, the thatched Ndumeni Restaurant is an ideal setting to enjoy a refreshing drink and a light lunch while soaking up the spectacular Drakensberg view. The menu includes teatime treats as well as light lunches and desserts and is a great way to finish the show and reflect on the fascinating history that surrounds us in this World Heritage Site. Special evening showings of the presentation can be arranged.